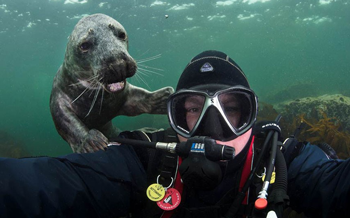 I came across this picture of a seal Pup and a Human off the coast of Northumberland and thought that my dear cuddly readers would like it. Personally as the title says I find it difficult to ‘like’ any water that is bigger than a few mouthfuls and can’t understand why other animals like it so much. But I have to say that these two seem to be enjoying gallons of the wet stuff. The more I looked at the this picture the more it seemed to me that Seals are like Dogs with fins, mind you this Seal, if he is representative of the breed, seems to suggest that his kind are a lot more intelligent that your average Bow-Wow, don’t you think? You know, I think I like Seals! I wonder, if in addition to the usual Horn honking and Beach Ball tricks they learn in Circuses, whether they can be persuaded to catch Prawns for hungry, Prawn deprived Cats?